Be careful that whatever panel you consider can drain properly in cooler climates. All solar panels are vulnerable to potential freeze damage if any water remains inside. You must physically remove them every fall and reinstall them every spring. 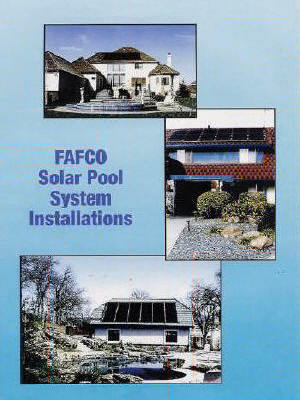 FAFCO has a 4x20' model too (see AGP) but is only recommended for seasonal above ground pool usage. FAFCO makes a standard 4x8, 4x10, and 4x12 foot panel (and other lengths special ordered) specifically designed for permanent installation that will drain properly. Qualify for all governmental and utility rebate programs if available in your area. From our 30 years in this business, we only recommend using nonmetallic panels for solar heating pools for the simple reason that pool chemistry can be very damaging to any metal whether it be copper, brass, or stainless steel. All pool components (pumps, filters, heaters, etc.) have moved away from metal and are now mostly all made of plastic materials. Most develop the Black Plague (internal deterioration) within 6-10 years . Click on this typical design schematic showing panel location and PVC piping connections to existing pool pump, filter and heater. This is a manual system with a 3-way bypass valve in the "return tee". This valve can be in either the solar feed or return tee and is usually motorized for automatic operation and greater system efficiency. The main design consideration is to have sufficient solar panel surface area to transfer enough heat to the pool during the day to offset overnight heat losses and thus steadily increase the pool’s temperature. Adequate solar panel surface area for your pool size and local climate taking into account your desired pool temperature and length of swim season. Panel area can be 50-75% of your pool’s area depending on geographic location and specific site considerations such as panel orientation and pitch as well as wind and shade conditions. Panels plumbed in parallel and connected to your existing pool pump and filter so they can drain if freezing weather is possible. A solar control to monitor and thus maximize solar performance. A pool blanket used as needed during the coolest months as needed to minimize pool heat loss and thus enhance the solar system’s ability to achieve and maintain warmer pool temperatures. To be more specific, solar heating an in-ground pool is most dependent on pool size (surface area) and local climate. Every geographic area requires somewhat different solar system sizing to offset heat loss from the surface area of the pool. Recommended solar sizing varies from 50% of your pools surface area in sunnier areas to 70% in more cloudy environments like west of the Cascades. In Hawaii, since solar heat is needed only during the fall and winter when solar radiation is reduced, sizing is 80-100% of the pool's surface there. To figure your pool's surface area, use these formulas. Once you determine your pools surface area and recommended solar sizing for your location, the next step is figuring how many solar panels you need. For example, if your pool was 450 square feet and you lived in a 70% recommended area, your solar system would need to be 315 square feet. Now you need to determine panel location. Panels should face somewhere along an arc from SE to due West or compass reading 135-270o magnetic. It is important to use a compass if unsure. Be aware of your magnetic declination, the degree difference between magnetic and true South. For the NW, this varies from 17E to 22E and is 11E for Hawaii (see declination map). For example, the declination for Portland, OR is 21o E. Magnetic south on a compass is 180o, but true south is actually 159o. Ideally, due to warmer ambient temperatures, S to SW is often best. Less than favorable orientation can usually be offset by increased solar surface area. Avoid areas of shade between 10am-4pm. Flat roofs, or any shallow pitched surface less than 6o, should be avoided unless in Hawaii. Panels need to drain to avoid potential freeze damage when not in use over the winter and need a minimum 6o pitch to self-drain. Freeze damage to panels is NOT covered under FAFCO panel warranty. If installing the solar system flat is the only option, we would recommend another system that is made of a more flexible EPDM material that can handle some freezing conditions. However, the material is not as durable as FAFCO's Contact us in such a case. Most systems are installed on roofs since this is up out of harms way and usually free from most shading (see installation photos above). If you don't have available roof space in the necessary orientation, have shade problems, or simply don't want to use your roof, panels can also be installed on panel racks. Panels come in 4x8, 4x10, and 4x12 feet. The headers are actually 51" long. Measure the space you are considering for panels. Always use the largest pool panels you can fit since this reduces mounting hardware requirements. For example, seven 4x12' panels is 336 square feet, eight 4x10s is 320. More panel surface area is always better than less. Solar controls are also recommended for any system to achieve maximum performance. As far as we are concerned, they are a requirement on systems west of the Cascades and Hawaii for sure. Controls automatically monitor the solar system to operate only when it can add heat to the pool using very accurate thermister sun and water sensors to achieve maximum efficiency. Money well spent! Remember, solar panels will evacuate heat too if the pool water is warmer than the ambient air. Thus, you typically don't want systems running at night unless the pool is too warm and you wish to cool it down. Controls simply eliminate human error in system monitoring. A pool cover is always recommended to reduce overnight losses especially in windy or dry areas where evaporation is high. Any cover works to reduce evaporation and thus heat loss and can help any solar system perform better. The use of a cover can often allow you to reduce the recommended solar sizing and still get "swimable" water temperatures. These system are simple in design and easy to install. You can save money on contractor labor by doing it yourself. Consider self-installation. Check out our Self-install Program under Services. For installation information, check individual panel types. Installation procedure is the same for both SunSaver and REVOLUTION and similar for SunSaver ST.
See our "step-by-step" System Installation instructions under "SERVICES"